This month, my son Kenny and I travelled up the coast to Mission San Juan Capistrano (CA 4th grade mission project). We strategically planned our trip in hopes of seeing the swallows that arrive every year in March. 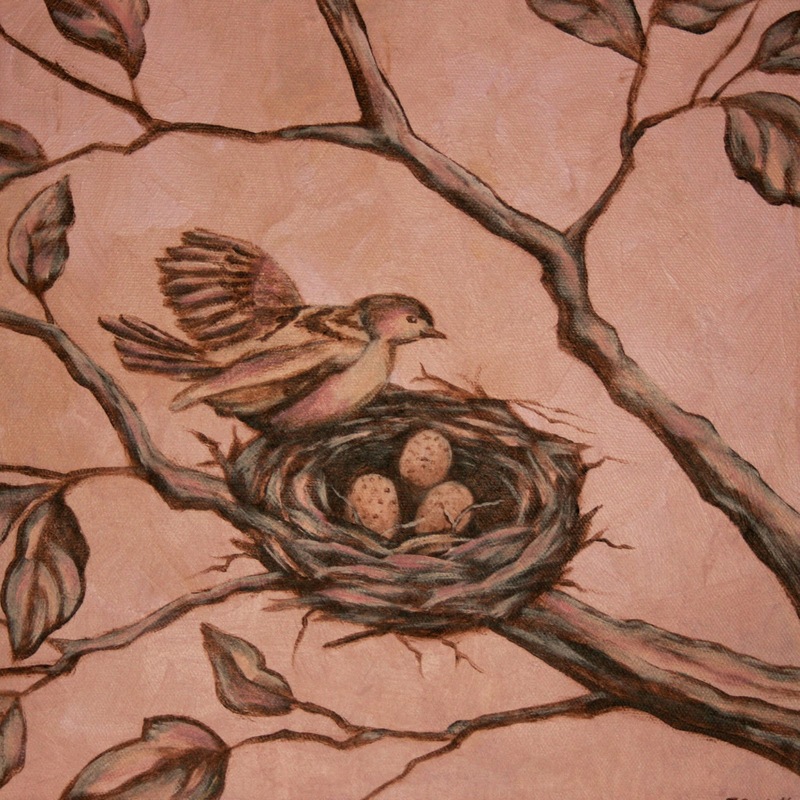 Their nests look nothing like the traditional little bird nest in my painting. 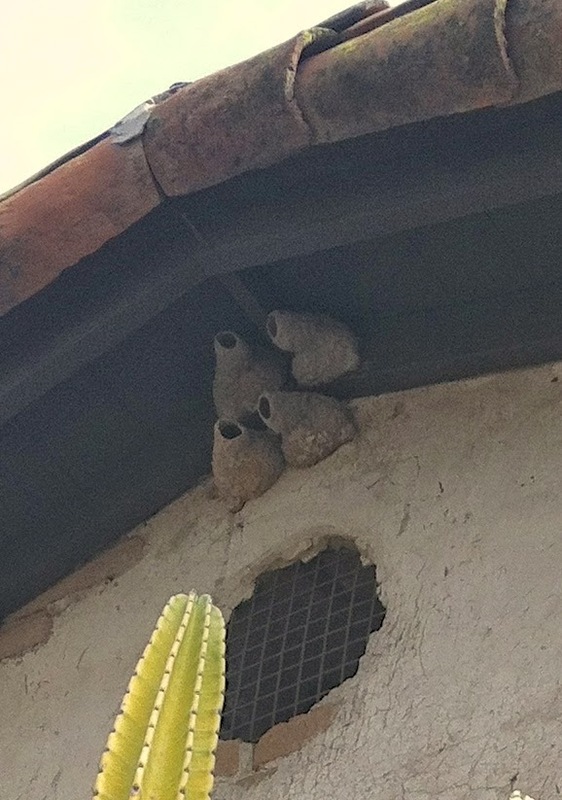 Swallows make mud nests. We were fortunate to see a few at the Mission, but sadly, most of the swallows have moved their nests to quieter locations. Our trip to the Mission was wonderful. It is a beautiful historic spot. In fact, the oldest building in California is at Mission San Juan Capistrano, Serra Chapel, where Father Serra performed Mass. We attend a community church (Flood Church, http://www.diveintoflood.com) that has a very different ascetic (modern and artsy) from the regal and traditional Catholic Church. My son and I soaked it up, and appreciated that we are all followers of Christ. It was a lovely and meaningful spot to visit this Easter season. The original entrance to the Mission. "RESURGAM" means "I shall rise again." As a child, my year progressed as I anticipated the next event. After Christmas, there was Valentine’s day, and then Easter, our annual spring beach camping trip, and then, summer break, and my birthday...etc. Remember at Christmas when you thought, “A whole YEAR until Christmas comes again!” It seemed like forever. Time goes oh-so-much-faster now, but I still find myself living in anticipation of the next celebration. While I cling to the old traditions, I love starting new ones too. For a handful of years, maybe seven, my life-long friend Daphne has hosted a beautiful Easter party. My little Genevieve has been asking for two months when we get to go to Miss Daphne’s egg hunt. There is one word that adequately describes the party: Abundance. I think she might stuff 4 million eggs. She also has completely over the top gifts for the adults. Last year she made giant paper mache eggs and stuffed them full of gourmet treats and presents. There are ever-flowing mimosas, gorgeous decorations, an extravagant craft table, and a fantastic brunch that we all contribute to. Kristen brings her amazing Italian Easter Bread; I make baked carmel french toast (see last Easter’s blog http://winsomewren.blogspot.com/2013_03_01_archive.html) and chocolate nests. It’s a party we look forward to all year! I adore this treat! Chocolatey, crunchy, salty, sweet, and cute to boot, you can’t go wrong. A fun treat for Easter, class parties, and spring birthdays. Thanks Carol, for sharing this recipe! Melt chocolate in a double broiler (or slowly on low heat). Add crunchy chow mein noodles and stir gently until covered with chocolate. Spoon out into lined muffin tins, hollowing out the middle in the shape of a nest. Arrange a couple robin’s egg candies on top. After it has cooled, remove liners. I really love Valentine’s Day. Beside the fact that I can’t get enough of the heart symbol (favorite), in bright, splashy red, smattered across everything, there are also mountains of chocolate everywhere. How can you go wrong? I have great fun celebrating the love of family and friends, in fun, silly, delicious, and homemade ways. I also appreciate the freedom of Valentine’s Day to be as big or little event as you would like to make it (unlike other occasions that are often filled with many obligations). SIMPLY CREATIVE: Valentine Making Party! I decided it would be great fun to invite some friends over to make Valentines. I gathered all of my supplies, set up a few tables where moms and elementary age kids could sit and be crafty together. Glue, paint, stamps, printed papers, glitter, pens, scissors, ribbons, etc. were available for making cards. In addition, there were rocks, canvas, burlap boards, and wooden picture frames that could be decorated as well. It was a fun time of creating, while we happily munched on coffee cake, fruit, and tea. There are a few days left; invite a few friends over and make some valentines together! My mother has made this recipe for as long as I remember. It is typically made in a bundt pan and the batter is layered with cinnamon sugar and walnuts. For Valentines Day, I wanted to make it in my heart shaped mold. Molded pans are very easy to use if you brush every crevice with crisco and then coat with Wondra flour. This method works well in a bundt pan, as well. My photo shows this cake as I made it in the heart pan, but the recipe below is for a bundt (baking times may vary for other pans). This cake is a great addition to a brunch, afternoon tea, or a shower. Mix on high, butter and sugar. Reduce speed to medium, and add eggs one at a time. Add sour cream and vanilla, beat well. Gradually add dry ingredients. Add 1/2 batter to greased/floured bundt pan. Sprinkle 1/2 of separate cinnamon/sugar/nut mixture over batter. Add the rest of the batter, spread evenly. Sprinkle with remaining mixture. Bake at 350 in preheated oven for 45 minutes. Cool for several minutes before releasing cake from pan. Cool, then sprinkle with powdered sugar. Cool completely before cutting. Love is patient, love is kind. It does not envy, it does not boast, it is not proud. It does not dishonor others, it is not self seeking, it is not easily angered,it keeps no record of wrongs. Love does not delight in evil but rejoices with the truth.It always protects, always trusts, always hopes, always perseveres. This year, I took December off from the blog. While my head spun with fun post ideas, I promised my family that I would desperately try to be more present in the midst of massive amounts of baking, wrapping, celebrating, etc. And, I will say, that giving up a few things helped. 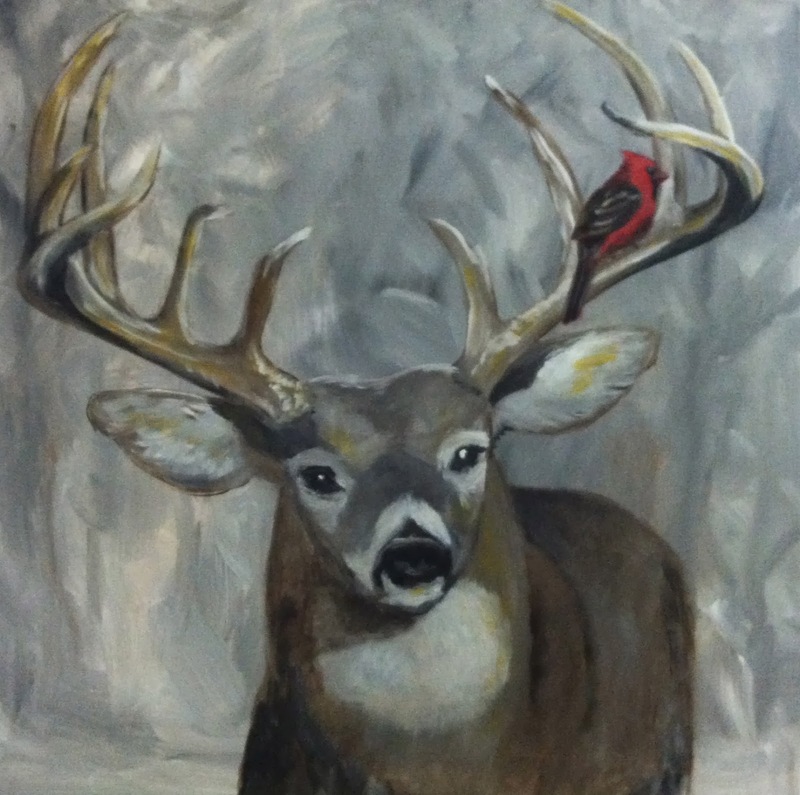 My painting and holiday decor this year flowed easily from December to January. I had created this painting at the beginning of December and while it worked well for Christmas, I am enjoying it as a January/winter scene as well. On the same theme, I incorporated the elk antler into my winter decor. My husband found the shed antler in the woods in Arizona. I added my succulent pots, pine cones, and candles, and over Christmas added red berries to the mix. My grandma (Namie, as we called her) taught me to make this delicious Clam Chowder. It is such comfort food on a cool winter night. Crusty, warm bread, salad...meal complete. Mince onion; brown in 2 TBS butter. Peel and cube potatoes (small bite sized cubes). Add potatoes, 1 cup water, salt and pepper to onions/butter and cook covered, medium heat, until tender (add a little more water, if needed, halfway through cooking). Check often and stir gently. Do NOT overcook potatoes. While potatoes and onions are cooking, melt 4 TBS butter and 4 TBS flour in large kettle on medium heat; slowly add 2 cups milk, stirring constantly. Thicken. Add onions and potatoes to milk mixture.